GQ-7 RE, Software parametric EQ from Synapse Audio. 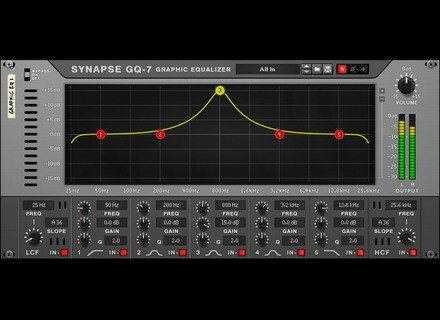 Synapse Audio released on the Propellerhead shop the GQ-7 graphic equalizer as a Rack Extension for the Reason DAW. Designed for both mixing and mastering, the Synapse GQ-7 RE offers 5 bands that can be toggle between peak and shelf, with adjustable gain, frequency and Q, as well as two high-cut and low-cut filters with slopes ranging from 12dB to 96dB per octave, so you can get close to a brickwall processing. The Rack Extension also feature an automatic gain compensation option based on the volume difference pre and post-EQ, and a Send mode completely removes the dry signal from the output so that you can process the EQed signal separately from the input. This mode can also be useful if you detect frequency issues in the mix. Last, the GUI offers interactive display with zoom. The Synapse GQ-7 is available at shop.propellerheads.se for 65€. The KDJ-One portable studio soon on KickStarter After a two-year absence, Cyberstep announces that its portable workstation project for musicians should soon be available. The djay 2 app now also on Android Algoriddim announces the availability of its djay 2 mixing app for DJs on the Android platform. A reverb that will haunt your Live 9 projects Max for Cats transforms into Max for Bats for Halloween and offers on Sonic Bloom a reverb add-on for Max for Live and Live 9.